An application to win listed status for a scaffolding structure at the gateway to the UK's largest illegal travellers' site has been rejected. For the past five years the gateway at Dale Farm near Basildon in Essex has carried banners supporting residents. 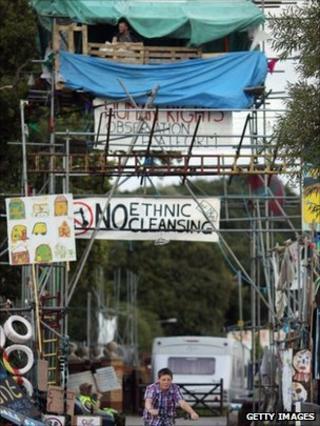 Campaigners applied to English Heritage, saying it was an "emblem of a struggle for traveller rights". Heritage Minister John Penrose said he had accepted the advice of English Heritage and would not list the gate. He said: "Although clearly a structure which is significant for the travellers at Dale Farm, the tubular steel, wood and rubber construction holds no special architectural or historic interest and does not therefore meet the criteria for listing." Meanwhile, two Dale Farm protesters have been charged in connection with an incident at Basildon Council's offices on Tuesday. The men, aged 22 and 29, are accused of using threatening words or behaviour to cause harassment, alarm or distress. They were bailed to appear at Basildon Magistrates' Court on 6 October. The clearance of the Dale Farm site had been due to begin last week. However, an injunction preventing bailiffs moving in is currently in place while legal appeals are heard at the High Court. The planned clearance follows a decade-long row over 51 unauthorised pitches on the six-acre travellers' site. The next court hearing is due to be held on Thursday. The campaigners bidding for listed status for the scaffolding said the structure provided a defence against bailiffs moving in. Resident Kathleen McCarthy said: "We're here to fight for our rights to a normal family life, for our children to get an education and for us to have security for our homes. "The tower is all that stands between ourselves and the bailiffs. "As long as it remains standing, we know that there are people outside our community who still care about our rights." But Tony Ball, leader of Basildon Council, said the move was an attempt to make a mockery of the planning process. "There are already several beautiful, architecturally significant and historical buildings with listed status within the Basildon borough that we are proud of," he said. "Considering Dale Farm is in breach of planning regulations, and with the ongoing health and safety concerns regarding the barricade, this is clearly another attempt to make a mockery of the planning process and laws of the land that apply to everyone."